The DD1.25 is a versatile unit specifically designed to handle loads in the lower weight range. (If you have heavier loads, then please look at our FS or FS DC data sheets). The table size determines that it is not suited to pallets over 1.2m wide or with overhung product. We would not normally build the DD1.25 with modified table dimensions or jaw opening. 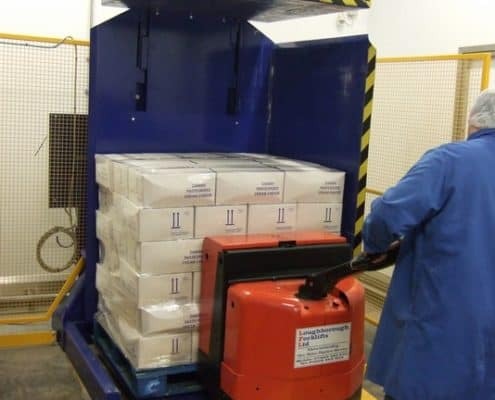 Ideal for handling finished goods (for example dairy products, pharmaceuticals, consumer goods and stacks of paper). Lightweight (1500kg) – easy to transport. Twin chain-linked clamping tables opening to within 110mm off floor level. 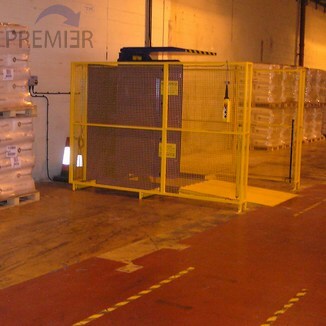 Can be loaded by forklift truck, stacker, or at ground level by pallet truck via a 1.5m long ramp. Compact size. Perfect for working in confined areas or difficult to access locations. Simple push button controls with option of semi or fully automatic controls. Best suited to lightweight (1250kg maximum), low volume applications. 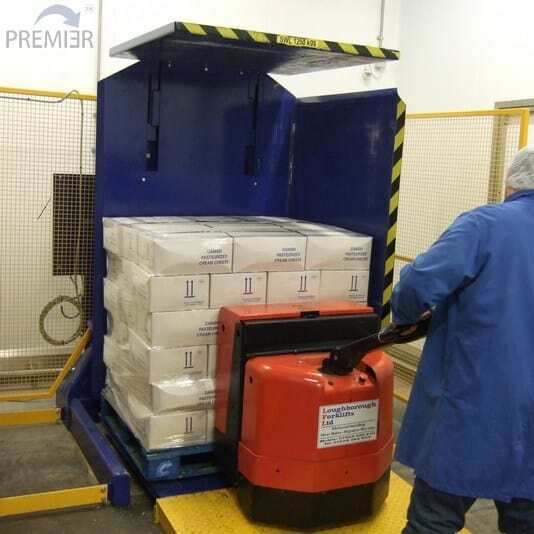 Load transfer from wood to plastic or other hygienic pallet. Switching outgoing loads to shipping or expendable skids. Transferring incoming goods to high quality in-house pallets. The DD 1.25 has a history all of its own as far as Premier are concerned, being the only inverter in the range not originally conceived, designed and built at the company’s Norfolk factory. In 2001 Premier bought out the inverter interests of their European competitor, LTF, based in Utrecht. Most of the Dutch machines worked on a dual clamp/’A’ frame principle and were similar in essence to Premier’s own models. However, the DD 1.25 was set up as a lightweight, lower capacity system mainly to handle 800 x 1200mm euro pallets. As such, it filled a gap in the programme ideally. Subsequent sales at home and abroad have confirmed this. The machine has an opening range which allows it to invert loads from 900 to 1900mm in height and up to 1250 kgs in weight. The tables open close enough to the floor to permit ramp loading if required. It is invariably supplied with attached guards and always has extended push button controls. Fork tunnels in the base enable it to be relocated easily from one part of the warehouse to another. It has a smart well-enclosed appearance which keeps it looking clean and presentable in food and pharmaceutical locations where, in common with the other inverters, it is mostly used transferring goods to and from clean pallets. Due to its low overall weight, it has proved an ideal system to demonstrate the concept of 180 degree inversion at trade fairs. Its compact dimensions make it equally ideal on a show stand or in a small warehouse where space is at a premium. 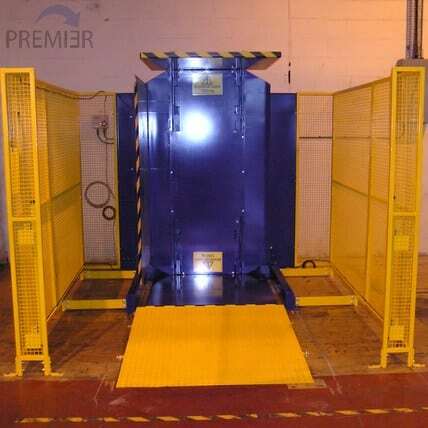 Can be supplied with 1.50m long loading ramp for floor level access. Depth increases to 3.00m when fitted with floor-fixed guards and multi photo-beams. 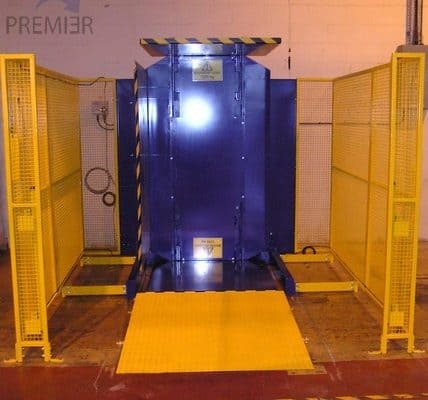 Standard shipping dimensions: 2.70m wide x 1.78m deep x 2.00m high with guards fitted.